This article is a short summary of Super Mario Bros.: The Lost Levels. Super Mario Bros.: The Lost Levels (named Super Mario Bros. 2 in Japan) is a Super Mario game released in 1986 for the Famicom Disk System. 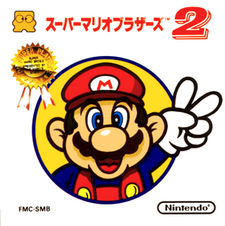 It was originally released only in Japan due to the game's high difficulty and similarity to the first game, and as a result a different game was instead released as Super Mario Bros. 2. The game was released for the first time in North America and Europe in 1993 in the game Super Mario All-Stars (with the name Super Mario Bros.: The Lost Levels). The original version of the game was later released in North America, Europe and Australia for the Virtual Console for Wii in 2007. Do you have what it takes to rescue the Princess and save the Mushroom Kingdom? Originally released in Japan as Super Mario Bros.® 2, this game has previously made only brief cameo appearances in the Western Hemisphere. Mario fans will appreciate the familiar look and feel of the game, while finding that its updated game play creates an entirely new challenge. In addition to the classic enemies already known to fans worldwide, there are also Poison Mushrooms, backward Warp Zones, and the occasional wind gust (which can help or hinder your progress). Players can also choose to control Luigi as the main protagonist. If that’s somehow not enough, expert players can go looking for the game’s secret worlds. So get ready to put your Mario skills to the ultimate test, and save the Princess again. Just don’t be surprised if she’s in another castle! The story is identical to the story of Super Mario Bros., the previous game in the series. Bowser, the king of the Koopas, invades the Mushroom Kingdom, turning its inhabitants into inanimate objects. He kidnaps the princess of the kingdom, who is the only one who can undo Bowser's spell. Hearing of this, Mario and Luigi set out to rescue her. Basic gameplay is the same as that of Super Mario Bros., in that it is a 2D side-scrolling platformer in which players play as Mario or Luigi, jumping and running on the way to the flagpole, which is the object of each level. The game features thirteen worlds with four levels each. At the end of each world, players must fight a boss, which is always Bowser or a Bowser imposter. Enemies are spread throughout the levels which must be avoided or defeated, many of which can be stomped on as a method of attack. Also spread throughout the levels are coins and blocks which, when hit, release coins or power-ups that can be used to aid the player. Unlike its predecessor, there is no two-player mode. Instead, the player is given the option of playing as either Mario or Luigi. In this game, Luigi is slower and has less traction, but is able to jump higher. Game Boy Advance 2004 (JPN) A direct port of Super Mario Bros., released as part of the Classic NES Series for the Game Boy Advance. Super Mario Bros.: The Lost Levels Wii (Virtual Console) 2007 (JPN/NA/EU/AU) A direct port of the game, released as a digital download for Wii. Super Mario All-Stars Limited Edition Wii 2010 A direct port of Super Mario All-Stars for the SNES. 2016 (KOR) A direct port of the original game with added Virtual Console emulator features. 2014 (NA/EU/AUS) A direct port of the original game with added Virtual Console emulator features. This page was last edited on 12 October 2016, at 23:41.